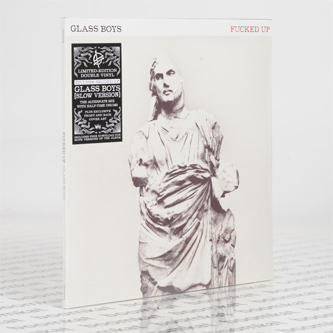 **Limited edition double vinyl edition - includes Original and Slow versions, with digital download voucher for both versions redeemable from the label** "Glass Boys’ carries echoes of some of the more ragged and adventurous bands from America’s punk past (Husker Du, Dinosaur Jr.) but it also has some of the anthemic charge of The Who and the guttural intensity of Negative Approach. Singer Damian Abraham still growls like a demon but he’s found more range and depth in his bark. Drummer Jonah Falco does something innovative on the album, adding two separate drum tracks, one of them in half-time, adding a psychedelic, disorienting feel. The triple guitar battalion of Mike Haliechuk, Ben Cook and Josh Zucker still builds symphonies out of feedback and powerchords but this time around there’s less emphasis on world-crushing riffs and more on world-creating textures. Bassist Sandy Miranda is now even more a part of that storm, her instrument blurring in with that overwhelming guitar roar. If the album’s lyrics concern the quest to stay true to your younger self, the music pulls off the trick beautifully. ‘Echo Boomer’, like ‘Son The Father’ and ‘Let Her Rest’ before it, makes for a powerful album opener, a surge of catharsis that gives a strong idea of what's to come. ‘Sun Glass’ builds from acoustic strumming to bleary pummel and stays pretty the whole time. ‘DET’ has one of those world-annihilating choruses that demands a full-room singalong and the album-closing title track is a blast of epic catharsis as grand and forceful as anything this band has ever done. After two monumental concept-driven concept albums, F*cked Up have made another heart expanding, life-affirming piece of work, and this time, they’ve done it by shooting straight from the heart."